I hope Y’ALL had a great weekend! Going back to PVS I wanted to share the resolution to an issue I came across recently during a client implementation. Instead of confusing you with a big giant paragraph, I’ll use one of my favorite templates back from my years on the Citrix Escalation Team. 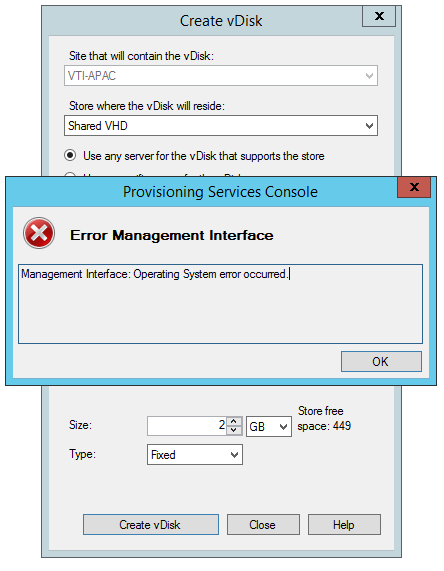 Attempting to create a vDisk on shared storage failed with Error Management Interface (Management Interface: Operating System error occurred). The same error was thrown both when creating it from the PVS Console and from the target device using the Imaging Wizard. Also, when validating server paths in the vDisk Store Properties, randomly Path Not Found message is displayed.